Digital Radiography (digital x-ray) is the latest technology used to take dental x-rays. This technique uses an electronic sensor for panoramic x-rays and phosphorus plates (similar to x-ray film) for bitewing & periapical x-rays (close up x-ray of an individual tooth including its root). The electronic sensor & phosphorus plates capture and stores the digital image on a computer. This image can be instantly viewed and enlarged helping the dentist and dental hygienist detect problems easier. Digital x-rays can reduce radiation 80-90% compared to the already low exposure of traditional dental x-rays. Dental x-rays are essential, preventative, diagnostic tools that provide valuable information not visible during a regular dental exam. Dentists and dental hygienists use this information to accurately and safely detect hidden dental abnormalities and complete an accurate treatment plan. 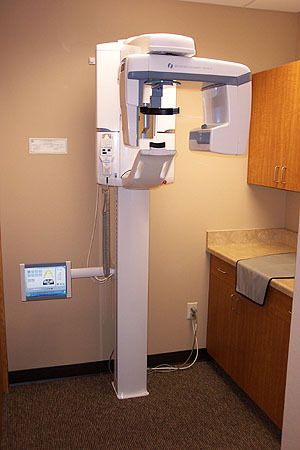 Without x-rays, problem areas may go undetected. A Panograph and Bitewing X-rays are recommended for new patients. They are usually good for three to five years. Bitewing x-rays (x-rays of top and bottom teeth biting together) are taken at recall (check-up) visits and are recommended once a year (or sooner as needed) to detect new dental problems.